A Beacon Stove in a contemporary loft space. A stove by Cornish Masonry Stove installed in Wiltshire. As the weather starts to turn a bit cooler, everyone’s thoughts begin to focus on staying warm for the winter – a logical concern. For those fortunate individuals living in a micro home, heating can be both economical and simple. In fact, it can even be off-grid. Solar energy and wind power are receiving lots of press coverage these days, but another form of heating off-grid which does not require quite as sizeable an investment initially, is the masonry stove – sometimes called a ceramic stove. These stoves operate by burning wood, however they are quite different from the traditional wood-burning stoves made of cast iron. They are constructed of brick, soapstone, stucco or perhaps most commonly, ceramic tiles. These stoves can heat an area for up to 18 hours with just one stick of wood! 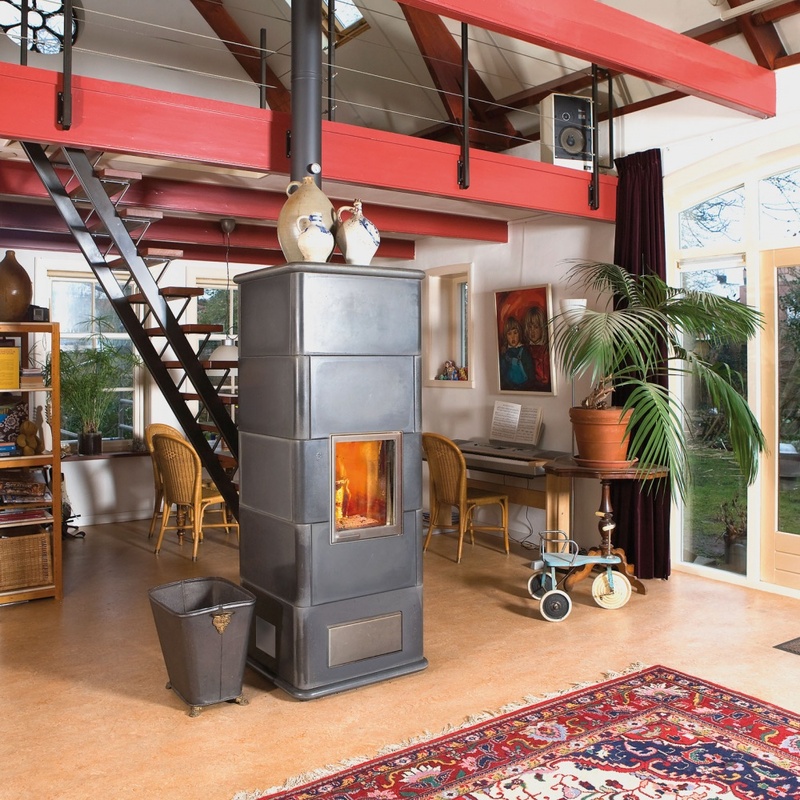 Just like a conventional wood burning stove, they have a flue to vent to the outside. However, masonry stoves are designed to burn the wood quickly, unlike a cast iron stove in which wood must be placed on the fire intermittently. Once the wood is consumed by the fire, the ceramic tiles radiate the heat evenly into the room, sustaining it over several hours. Despite the masonry stove’s ability to heat the room, the stove itself remains cool to the touch, making it a good option for those with small children. It heats over a longer period of time and at a lower temperature, maintaining a constant, even level of heat. The stoves also burn the wood more completely, so there is less waste, and minimal carbon production, compared with a fireplace or cast iron stove. 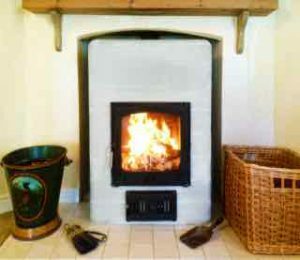 Although ceramic stoves can takes hours to warm up a conventional size home, they can heat a small space such as a tiny home or narrowboat very rapidly, which makes them a natural choice for small spaces. Another wonderful feature about these stoves is that they can be built to any size or description. The tiles can be decorative to make a statement in a room, or matched to the wall colour to blend with its surroundings. They can be neatly fitted into a corner, or even placed in the center of the room, as long as there is a means to vent them to the outside. And if you move to a new dwelling, the smaller, freestanding versions are portable. There are many sources of masonry stoves in the UK, but here are just a couple to get you started on your research which are featured here. Beacon Stoves of Newcastle has designs which are both classic and contemporary and you will find a gallery of them on their website. Cornish Masonry Stoves is another excellent company with range of designs that could easily blend with almost any décor. There are also wonderful old antique stoves which can be repurposed and are waiting to be discovered in estate sales and salvage yards. 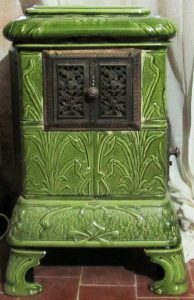 An elegant 19th century ceramic tile stove. For many, one drawback in using any kind of wood-burning stove may be the fear that forests will be destroyed in favour of warm winter comfort. It’s important to remember that wood is a renewable resource, and is grown as a crop, just like tomatoes and carrots. The difference is that wood is harvested every 14 to 16 years (depending on the species of tree) rather than annually as our vegetables. During that 14 years of growth, trees provide cleaner air, food for foraging animals such as deer and rabbits, and a habitat for birds and other wildlife that nest in them. Unfortunately, wood producers will only grow what they can sell. The less wood that is used for paper and other wood products, the less they will produce. It’s important as a consumer to know where your wood is coming from and that is it responsibly sourced. The Forest Stewardship Council, http://www.fsc-uk.org whose goal is to maintain “forests forever, for all,” provides a list of wood suppliers and products, and their sustainability practices. Also, www.wwf.org.uk has a list of helpful tips for sorting sustainable wood suppliers.